I have a newer brand to share with everyone today! You Polish was previously sold under the Makeup Your Face brand name. 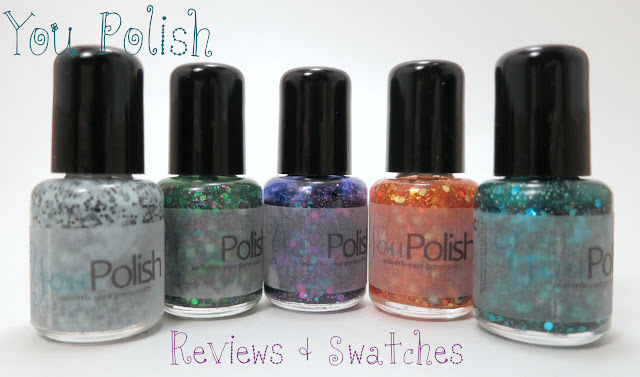 While I never purchased anything under the older name, I love what Lauren, the creator of You Polish, is creating now! Choco-Mint Chip has light green-blue base with black squares and hexagons. I used 3 coats with a top coat of Seche Vite. Lauren offers this polish, and all of the polishes from her We All Scream For...Nail Polish collection, in scented and unscented formulas. I received a scented version and I love it! It smells of mint and chocolate, perfectly fitting for the name. ;) The color is spot on for mint chocolate chip ice cream and, well, it smells and looks good enough to eat. :P Formula was a perfect consistency and it dried quickly. It was pretty bumpy before a top coat, so I would recommend one. kickSTARter has a bright green jelly base with a mixture of green, silver, purple and pink glitters and iridescent bar glitter. 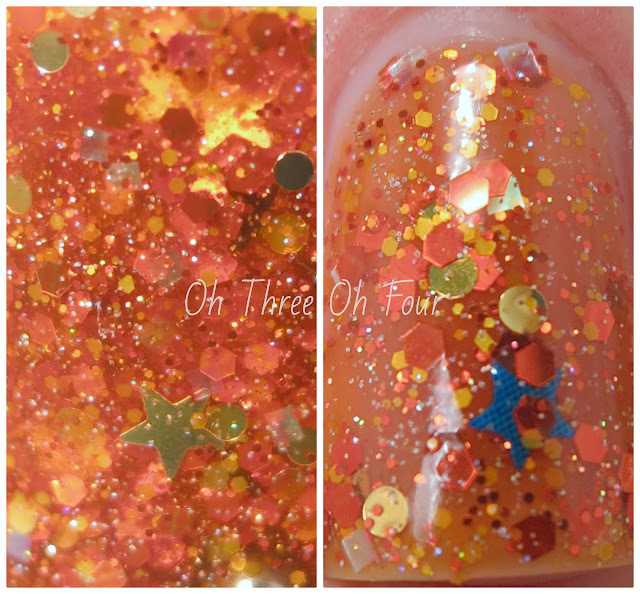 All nails are 3 coats with a top coat of HK Girl Top Coat. STARdust contains iridescent square glitter, large and small pink circle glitter, pastel pink stars and fine holographic and pink glitter all in a purple jelly base. I did 3 coats with a top coat of Seche Vite. STARgazer has an orange jelly base with various orange and gold glitters, iridescent square glitter and small blue star glitters. I used 3 coats with a top coat of Seche Vite. Normally I'm not a fan of orange polish because they normally don't work with my skin tone, but I really do love STARgazer! :) I love how it is jam packed with glitters and sparkles at any angle. I think the little blue glitters really help add something extra and different to the over all look of the polish and remind me of the Florida Gator colors. ;) Formula was a bit thick, assuming because it has so much glitter in it, and dry time was about average, again most likely due to all the glitter, but neither of these hindered application and I didn't need to fish for any glitter. superSTARdom is a deep teal/green jelly with blue, black and teal glitters in various shapes and sizes, fine holographic glitter and, as with all the polishes from the STARjelly collection, star glitter! All nails are 3 coats with a top coat of HK Girl Top Coat. You can purchase from You Polish through Etsy or by messaging Lauren via Facebook. She offers tons of products including: custom polish, cuticle oil, hand cream and subscription boxes.